For no other reason than Sakuragi's personal ambition, he has advertised his intention to produce 100 successful Toudai applicants from the students of a nearly bankrupt failure of a school. 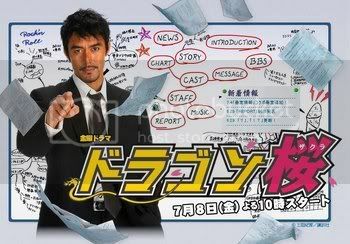 if u like hana yori dango and nobuta wo produce i recommend u to watch dragonzakura. oh i LOVE Masami Nagasawa ! i love maki!! her hair is so CUTE!!! but at the last episoide maki shout until her voice becomes cracky! this is a really good show as well!! I have been thinking about downloading this.. I wonder if i would like it. by the way, do u guys watch on youtube or u download it? my computer doesn't have much memory so i use to watch it on youtube..
guys, which characters do u like best in that drama? my favorite character has to be yusuke (yamapi)!!! he looked so cute in the drama, and I really like his role. Stubborn and yet looks out for his friends, LOVE HIM! I bought the whole set of VCD, so no need to watch it on computer. Domo arigato yumiotsuka, for the info of this series. and leave my comments after that . *okay so, Just watched the couple of firstest episodes and i gotta say i got hooked to this drama. woot yamapi!! I wanna see it for him! lol.. so many girls watch this show because of yamapi..
any show that has yamapi on it u guys will watch right ? great. i love her too. sekachuu is one of my favorite. mokomichi? kyaaa. i wanna see it!